Too Many Carrots is a whimsical story with a resourceful rabbit and his crew of animal friends. Despite their misadventures along the way, these friends stick together and demonstrate what the power of sharing is all about. The illustrations are vibrant and the message is clear...friendship prevails when adversity strikes. Many thanks to author Katy Hudson for granting me permission to use her book as the inspiration for this book companion. Bounce into Spring with a a variety of language activities for PK-5th grade. Sharing Carrots mini interactive Velcro book addresses spatial concepts as well as 1:1 correspondence for counting carrots 1-10. It prints in color. 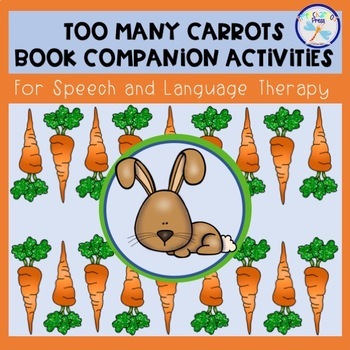 Too Many Carrots Book Companion Comprehension Questions is presented in a colorful Squishy Squashy Play-Doh Mat format for younger students. Ten "WH" questions are embedded at the bottom of the mat. Nine "WH" Comprehension Task Cards include 3 colorful picture answer choices per card. Move a clothes pin to the correct answer choice or any small manipulative of choice will work. Sequencing Path is a black and white worksheet for older students. Students read each of the story events, cut them out, and glue them in correct sequential order. Big Problems & One Solution is a black and white worksheet for 2nd thru 5th graders. Students identify each of the animal's problems and determine a solution.